My journey to geology started one class at a time. In my mid-twenties, with a full-time office job, life seemed sweet, except there was a void in my education that needed filling. I began taking classes, part-time, at Coconino Community College. I enrolled in each science course available, and finally found my niche in geology by way of an oceanography research project where I correlated off-shore buoy data to seasonal beach face changes. After 6 years of taking one class at a time, while working full time as a file clerk, I had earned my first degree: An Associate of Arts in Liberal Studies, and I had a new-found passion for learning. Since it’s difficult to train in the geology discipline from behind a file clerk’s desk, I quit my job and focused on school. The decision to leave my career, my friends, and my life behind came after a discussion with management in which I was told to choose between school and work. I woke up the next morning and knew that if I wanted a better life, it was up to me to work for it: I left my career and became a full-time student. The transition to becoming a full-time student was more challenging than I expected. Giving up a career and the stability that comes with it meant that I had to give up my comfortable life, but I found support in my classmates and friends who put a roof over my head and food in my belly. In 2017, I completed my Bachelor of Science, in Geology, at Northern Arizona University (NAU) and am now working on a Master of Science in Computer Science at Regis University. Many amazing research opportunities came along my journey to becoming a geologist, all which had the common thread of measuring how and why sand moves. My undergraduate geology research included California State University Channel Islands (CSUCI) Project ACCESSO summer internship, NASA NAU Space Grant, a Student Contract with USGS Astrogeology Science Center(Astro) which grew into a Pathways Internship. My work for CSUCI Project ACCESSO was focused on Sandy Beaches of southern California; we measured many parameters of the beach including grain size and beach face slope, and biological richness. Learning how to measure slopes of sandy surfaces and do a grain size analysis led me to my Space Grant where I worked on correlating the movement of sand dunes on the Navajo Nation with a grain size analysis of the dunes. My student contract work with Astro started with image processing for the Mars Exploration Rover (MER) Microscopic Imager (MI). I processed data from the MI to create images such as anaglyphs, color merges, and focal merges but blossomed into building a database to contain metadata for the images and a website prototype to share that data. While working as a student contractor for the MER team, I was asked to join another group of people doing research and joined their team to do a grain size analysis of sand collected at their Mars analog dune site. The research I did for my Space Grant was accepted for a poster presentation at the 10th International Conference for Aeolian Research (ICARX) in Bordeaux, France. ICARX is an international conference dedicated to wind erosion and transport phenomena. The financial support I received from GEM Environmental made it possible for me to attend the conference. They supported me with a $1,000 scholarship which paid for my transportation and hotel for the conference. My poster was displayed for two days, and my abstract included in the abstract book (https://colloque.inra.fr/icar2018/Program). This was my first conference in a different country and my first trip to another continent; it was a life-changing experience. I was able to network with people doing similar research, those doing complementary research, and those studying things I had never imagined. 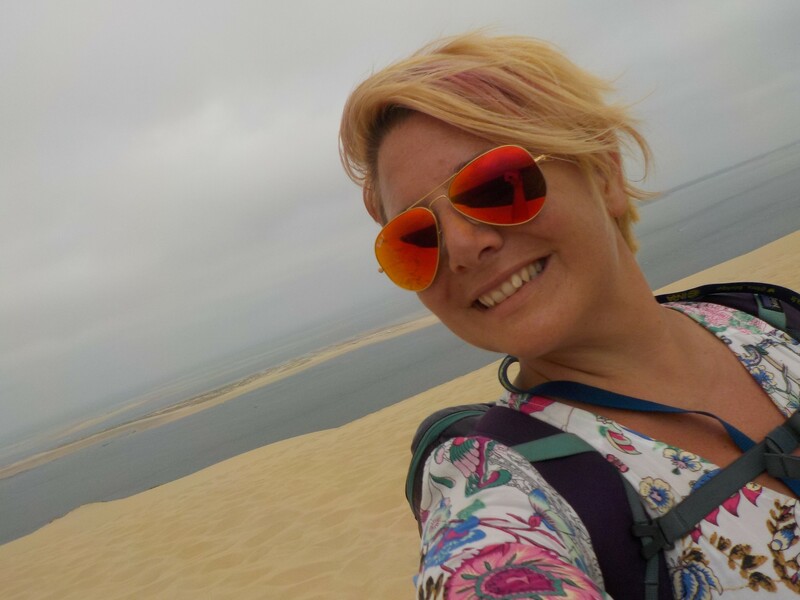 For a week I lived and breathed wind-driven sediment transportation and had a field trip to the largest sand dune in Europe, the Dune du Pilat. My Future Career in STEM: benefited! My time in Bordeaux was dedicated to the conference; most people go to Bordeaux to drink fine wine and admire the art, but I spent most of my days drinking fine wine and talking about wind driven sediment transport. The time I had between presentations, I asked questions and took notes. Evenings were spent riding a bike through the narrow streets while trying not to run over pedestrians or get run over by trams. I returned home with a collection of knowledge about active research projects from around the world, and made networking connections for potential collaborations. The field of research in sediment transportation is small and somewhat disconnected; attending ICARX helped me bridge some of those gaps. After this conference, I attended a proposal writing workshop for sediment transport and was able to inform key decisions based on connections made at ICARX in Bordeaux. By the end of the workshop, I was co-point for a project, tasked with finding funding sources, finding data archives, and maintaining the momentum from that workshop. If I ever need to remember for a moment, why I do science, I remind myself of the dead-end paper shuffling career and the struggles I went through to get here. I recall the friends and family that supported me when I wanted to give up, and those that gave me a home when the alternative was sleeping in my car. I think of the people that shared their love of science with me and the incredible projects I’ve had the opportunity to work on. My old chemistry professor, Dr. Salami, comes to mind often; his words are burned in my memory “You will not fail! Do not give up! Failure only happens when you give up.” Dr. Salami would be happy to see how far I’ve come since his introduction to chemistry course. Working at Astro is a daily reminder that with determination you can achieve anything. My passion in science is sediment transport and through that I found data science. My Pathways Internship at Astro allows me to combine my passions and grow as a scientist.